Join EIB Education for an evening seminar, focusing on how the International Baccalaureate and the UK university application system (UCAS) fit together. The talk will contain crucial guidance on tackling the IB diploma, as well how to use it to your advantage when applying to UK universities. How do UCAS and the IB fit together? Will taking 4 Higher Levels boost my application? What are the deadlines for UCAS submission and will early submission help my chances of gaining an Oxbridge place? Do I require HL Maths to study Engineering? Do I need 3 Sciences to study Medicine? How does the IB compare to A-levels in terms of university applications? What subjects should I pick and at what level? What are the course requirements for the IBDP? This seminar is tailored towards students in either their first or second year of the IB Diploma programme and their parents. At each event, free documentation will be provided including an IB advice book, an IB specific UCAS required grade matrix, and IB-specific wall calendars. 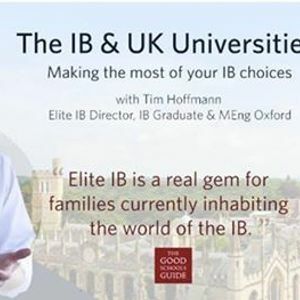 Tim is the Founder and Director of Elite IB Tutors and EIB Consulting, and firmly believes that the International Baccalaureate’s educational ethos and structure makes it the foremost school-leaving qualification worldwide. Tim completed the IB at Antwerp International School in 2005 with 44 points and went on to earn an MEng from St Edmund Hall, Oxford University in 2009. He has been tutoring IBDP & MYP candidates since 2006, and started Elite IB in 2010. 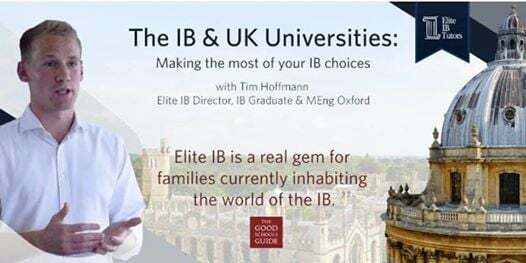 Over the years, Tim has interviewed over 600 IB graduates and worked with countless students, families and schools, guiding them through the ins and outs of the IB programme and UK & Oxbridge university applications. Tim is well-placed to share how the IB prepares students for university life in Oxford, and how to make the most of their IB diploma. Spaces are free but limited and on a first-come first-served basis. Please sign up through the registration button, or by emailing Y29udGFjdCB8IGVsaXRlaWIgISBjbyAhIHVr quoting the event title and venue to reserve your space. Four free 20-minute consultations will be awarded after the seminar ends. Please make this request upon application. These consultations can cover anything within the realms of IB, UCAS or Oxbridge. We are an IB specialist private education company, dedicated to improving students' performance on all aspects of their International Baccalaureate. Our tuition team is comprised only of experienced Oxford, Cambridge, and Russell group university graduates, IB examiners, and IB teachers. EIB offer structured, bespoke tuition based on a firm understanding of the intricacies of the IB. With offices in London, Geneva and Singapore, and a team of tutors and consultants spread throughout the world, we are perfectly placed to support students at all stages of their IB journey. Our university consulting and revision courses continue to grow year on year, helping students in a variety of countries to gain access to competitive courses, including the highly regarded Universities of Oxford & Cambridge, and medical degrees. You can find out more about our team here. Spaces are limited and on a first-come first-served basis. Please sign up through the registration button, or by emailing Y29udGFjdCB8IGVsaXRlaWIgISBjbyAhIHVr quoting the event title and venue to reserve your space. Please e-mail Y291cnNlcyB8IGVsaXRlaWIgISBjbyAhIHVr with any queries leading up to the talk. No, a version on your phone will be fine. Yes, that is absolutely fine.